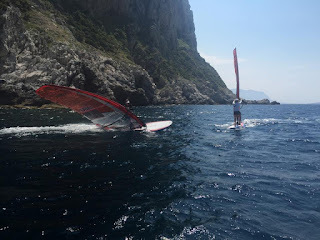 After finishing the French Olympic Week in April, I needed a training block to focus on improving certain technical and tactical aspects of my sailing. I decided not to compete in May’s Eurosaf events in order to have the maximum water time possible and give me space to focus away from hectic regatta logistics. The past month’s training has been critical technical preparation for the Rio Olympic Test Event in August and the RS:X Worlds in Oman this October. I completed training camps in three different venues over the past month and a half, including Cadiz, Brest, and Palermo. Cadiz, in southern Spain, is a windy venue that allowed me to test my speed and improve technique in planing, choppy conditions with fast training partners. In Cadiz, I also sorted out equipment in preparation for the more important events later this year. Small details such as these must be done well ahead of time; the weeks before important events must be focused on racing and rest rather than physical and technical preparation. 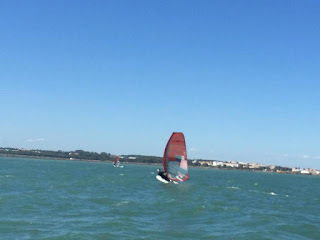 In Brest (north France), I worked with a coach on board handling, technique in marginal conditions, downwinds, and strategy in a variety of the tricky and cold conditions the venue is well known for. A number of competitive French youth girls and boys also attended the sessions. I was very happy with how I trained at this venue, and I am in the process of developing an automatic feel for being detail-oriented on a complicated racecourse. Brest isn’t exactly a sunny vacation destination, so it was also a good chance to get caught up on equipment repair and organization, taking care of repairs to the van and boat, and the endless budgeting. 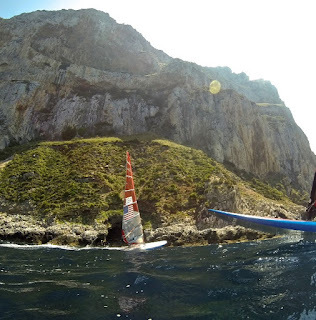 Vacation destinations definitely include Mondello Beach, just outside the city of Palermo in Sicily, where the RS:X Europeans are being held the last week of June. This event will serve as a test for the skills I will need to improve before the Test Event and the Worlds. After the 15 hour drive and 20 hour ferry, I’ve had an excellent training block here already with Spanish, Polish, and Italian sailors,and there is plenty of sunshine for all. Racing here will definitely be interesting, because there are very strong coast effects that create a very one-sided course…except when the wind gets gusty and then it’s a directional free for all. I’m happy to report that my speed is quite good and I’m stacking up well against the others. The fleet is going to be very strong here and the girls I’ve been training with are all very quick, smart, and prepared. There are already 60 girls registered in the senior fleet. Many of the international teams are using the event as their first Olympic qualifier, so the atmosphere could be a little serious! In the next few days I’ll be trying to sort out repairs and rest up before my coach arrives for another small training block before the regatta. I’m looking forward to this event as a stepping stone to my peak events later this year.